The swordsmiths with names starting with the kanji character UN (雲)such as Unshô (雲生), Unji(雲次), and Unjû (雲重)are either called Un-rui (雲類派)(Un family) because of the character, UN (雲), in their names, or Ukai-ha (鵜飼派) because they resided in an area in Bizen Province called Ukai-no-shô (鵜飼庄). While Unshô (雲生) is usually acknowledged to be the founding member of this school, he has left us no dated works, at least none have come to light to date. Unji (雲次), however, who is held to have been shodai Unshô’s (雲生)son, is represented with examples dating from Shôwa 4 (1315), Bunpô 2 (1318), Kenmu 2 (1335) and so on. Unjû’s (雲重)works bear date inscriptions from Bunna (1352-1355), Enbun (1356-1360), and Ôan (1368-1374). Therefore, it can be surmised that the active periods of the three Ukai (鵜飼) smiths are as follows; Unshô (雲生)-late Kamakura, Unji (雲次)- late Kamakura or early Nanbokuchô, and Unjû (雲重)-middle Nanbokucho. It is further surmised that this school had its roots in the Yamashiro tradition and migrated from there to Bizen in the Kamakura era. These three smiths formed a unique group in the Bizen school in that their blade characteristics are, with a couple of exceptions, almost mistakable for Yamashiro works, especially the Rai smiths, or works produced by the Aoe smiths of Bitchû Province. Their blades have either suguha with ko-nie scattered tight nioi-guchi containing ashi and yô, or ko-midare based patterns composed more dominantly of nie than the other, suguha type. 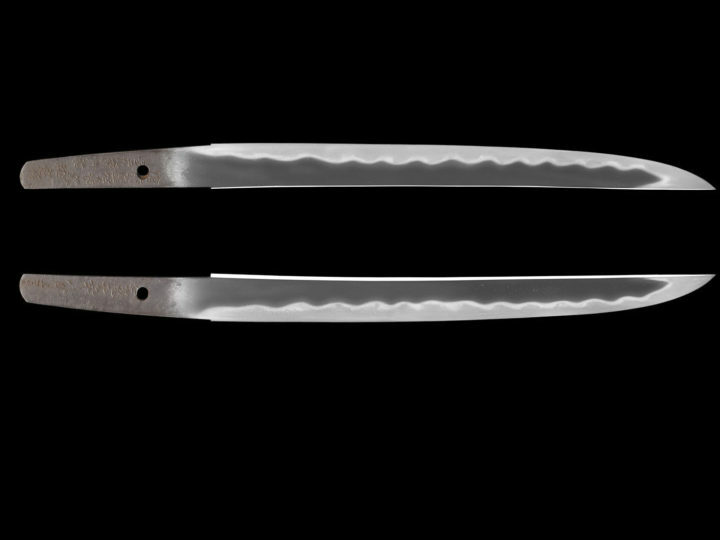 Utsuri is more conspicuously presented in the blades with the former type of hamon. The presence and type of utsuri is one of the characteristics that separates them from the Rai and Aoe schools. While the Rai school will, on occasion, show utsuri, the type of utsuri in the Unrui (雲類派)group will be different in that it is midare or jifu utsuri looking almost like fingerprints in the ji. 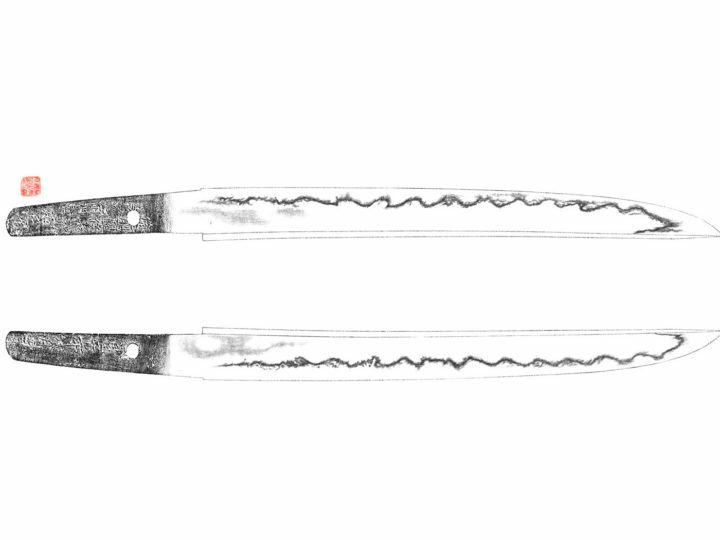 Besides the Unrui (雲類派)works discussed in the above two types, Unji (雲次)occasionally produced blades with a ko-midare hamon in which hotsure, sunagashi, and uchinoke are abundantly presented and with bôshi containing swept lines of hakikake. These characteristics together with the jigane containing partially straight grain amalgamate into the semblance of the Yamato school. The craftsmanship of the Ukai (鵜飼) school was somewhat different from the contemporary Osafune tradition. Namely the Ukai (鵜飼) works, although based in the Bizen tradition, is mixed with elements from the Yamashiro tradition. It also received considerable influence from the Aoe school that was in the adjacent Bitchû Province. The works of the Ukai (鵜飼) smiths are quite unique within the Bizen tradition. The major traits distinguishing the Ukai (鵜飼) or Unrui (雲類)work from other Bizen schools includes the jifu-containing kitae with an outstanding mokume structure clearly showing in the ji. The nakago will be formed to be thicker on the edge side, o-sujikai yasurime, and the mei inscriptions emphasizing the reversed strokes following the Aoe’s school method. The tachi shape done in torii-sori combined with the high shinogi, the perfectly rounded bôshi and the exceptionally tight ko-itame, will all bear a semblance to the works of the Rai school. SUGATA: Since the works of the three main smiths of this school encompassed a period from the late Kamakura through the middle of the Nanbokucho, their sugata will reflect that which was normal for each time period. The works of Unshô (雲生)will show the graceful shape of the Kamakura era with a gentle sugata inclined toward a ikubi kissaki. Early works of Unji (雲次)will tend to be wider with a somewhat extended kissaki as was typical toward the end of the Kamakura era. The works of Unjû will be much more typical of the Nanbokucho era with a wide and thin sugata with a greatly extended bôshi. Most works are in shinogi-zukuri with a torii-sori resembling the Rai school. Tanto are rare. JITETSU: The kitae will vary with a tightly packed ko-itame, particularly commonly found in the works of Unshô (雲生) and Unji (雲次). There will be mokume mixed in and occasionally some masame will be found. The works of Unjû (雲重)will have a much more flamboyant mokume with more masame mixed in. Utsuri will be present in either a midare or jifu form. HAMON: We find most of the hamon are based on a suguha containing areas of ko-chôji, ko-gunome and ko-midare variations. It will have a deep nioi structure thickly covered with nie grains forming multiple swept lines (sunagashi) and fraying (hotsure). Often, we find areas of niju-ba. The habuchi will be covered in ko-nie and streaked with sunagashi. Unshô (雲生)sometimes stopped the hamon short of the machi (yaki-otoshi). BÔSHI: Most often we find a smooth round curve with a short kaeri. There will also be some with hakikake and a slightly pointed tip. NAKAGO: The yasurime are o-sujikai or katte-sagari. Dimensions: Length: 64.7 centimeters; Curvature: 1.2 centimeters; Width at the Base: 3.5 centimeters; Width at the Point: 2.95 centimeters; Kissaki Length: 9.4 centimeters; Nakago Length: 18.2 centimeters; Nakago Curvature: 0.1 centimeters. Features: The construction is shinogi-zukuri with a mitsu-mune. The blade is wide, and the curvature is shallow. There is an ô-kissaki. The kitae is itame mixed with masame, and the hada is prominent. The hamon is sugu in style with gunome-midare. There is ashi and yô activity, and the habuchi is covered in ko-nie. The bôshi is midare-komi with a slightly pointed tip and kaeri. There are bôhi with soe-bi carvings on both sides of the blade that run off the end of the nakago. The nakago is ô-suriage with a kurijiri. The yasuri are kiri, and there are three mekugi-ana. The blade is unsigned. 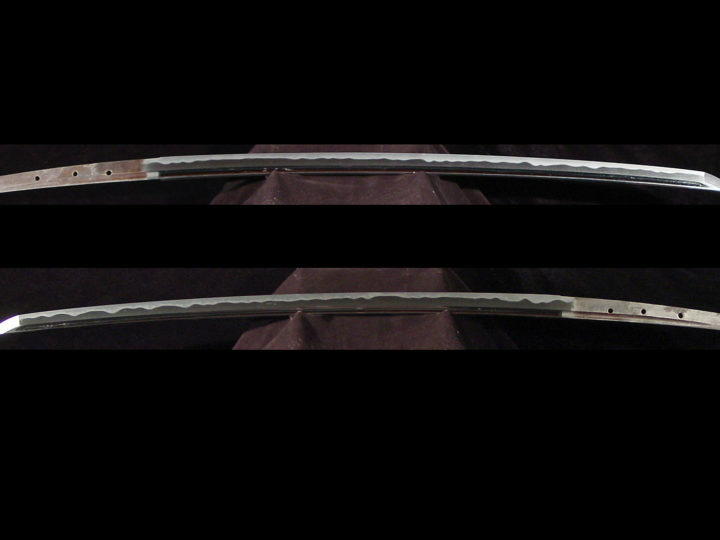 Explanation: This is an ô-suriage mumei katana that has been designated as a work of Unjû of the Bizen Ukai School. 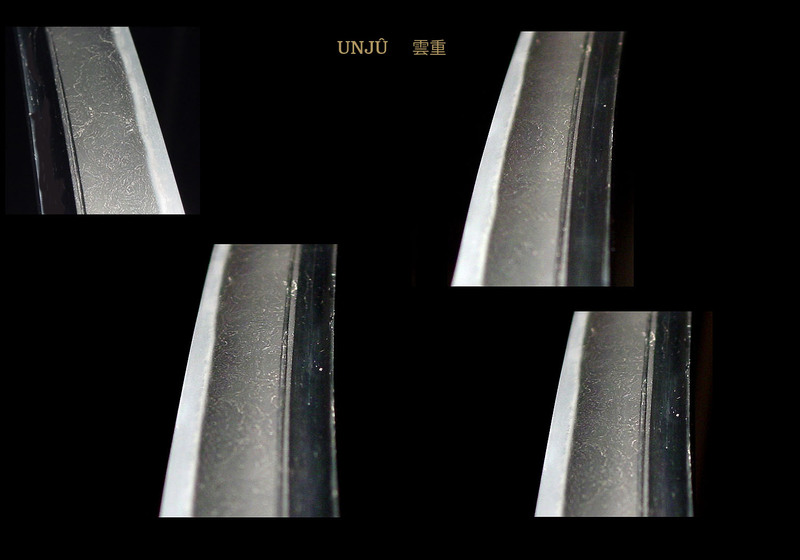 Unjû is a sword-smith who is a continuation of the same school as Unshô (雲生) and Unji (雲次). Among his extant works, there are blades that are dated to the Nambokuchô eras of Bunna (1352-1356) and Jôji (1362-1368), which clarifies his periods of activity. 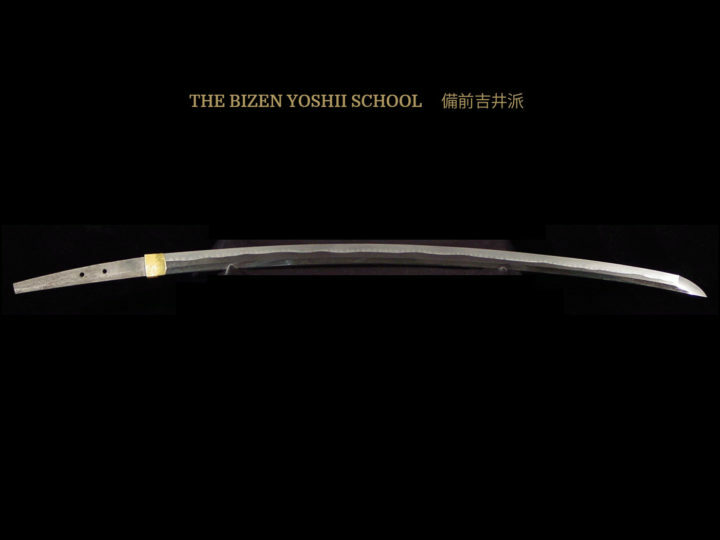 As for the works of this school, while they are in Bizen, there are a great number of works that could be mistaken for blades from the Rai School of Yamashiro or Bitchû works. However, when we get to Unjû’s period of activity, the blades become magnificent in shape like that of this sword, and because of the influence of the Sôden, the nie covering becomes powerful. Moreover, the utsuri in the ji is not so prominent. 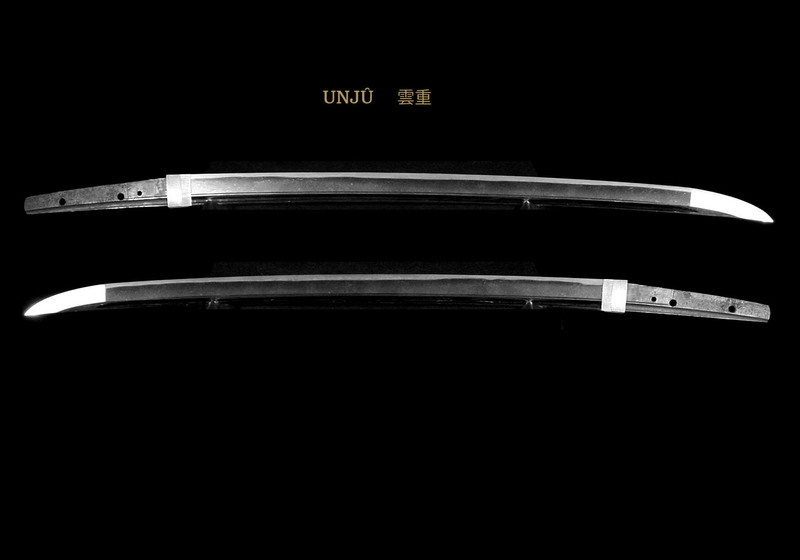 This sword displays Unjû’s style of workmanship in the ji-ha, and we can agree that is in accordance with the traditions of the school.